A hearty casserole to satisfy the whole family! 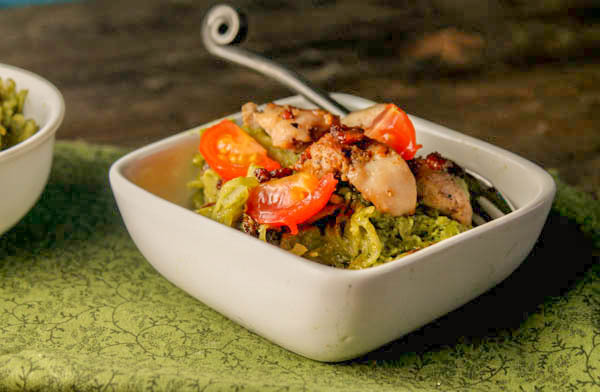 Loaded with pesto, bacon, and crispy chicken, this low carb dinner is full of flavor! 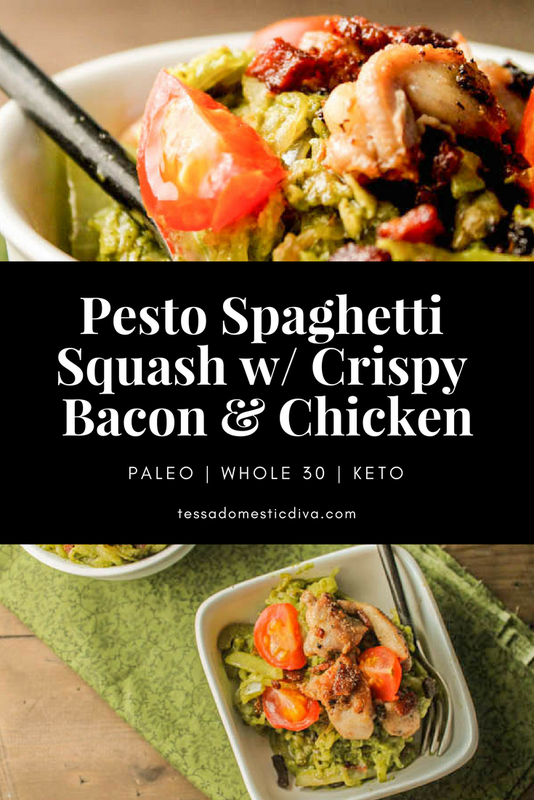 A flavor packed meal made with spaghetti squash, bacon, pesto, and chicken! A few years ago, I made a fabulous recipe. It was a family keeper!! And then one sad day, I went to open my old pin to make it again….and the website was no longer there, and neither was the recipe. The blog AND the beloved recipe disappeared! Not one to give up so easily…I started using the main ingredients I remembered to come up with my own version to be forever memorialized here on my blog. After all, why should I get ALL the yummy food just to myself?! Beautiful, flavorful food was meant to be shared! I use my faithful 12″ cast iron skillet for this (and just about everything I cook!). The browning that you get from cast iron pan cannot be beat…and this one comes pre-seasoned so I have never had an issue with sticking food! Here are some additional Paleo dinners to enjoy! 1 pound boneless skinless chicken thighs cut into bite sized pieces. Prepare your spaghetti squash, cool, shred, set aside. In a large 12" skilletover medium low heat, gently cook the bacon until crisp. Remove with a slotted spoon, set aside. Bump the heat up to medium-high. Add the chicken, garlic granules, and a sprinkle of sea salt and pepper, in a single layer (otherwise it will steam, not brown). THEN LEAVE IT ALONE< DON:'T MOVE IT! Let it get crispy---about 5 minutes. When chicken is browned, flip to the other side and continue. When crispy and cooked through, remove to the same plate as the bacon. Bump the heat down to medium low again, and saute the onion until very soft, 5-7 minutes (This is where you add any other additional veggies too if you choose). To the cooked veggies, add in the reserved spaghetti squash, bacon, chicken, and pesto. Turn the heat up to medium and saute until all the pesto is evenly distributed and the dish is hot throughout. I could see this becoming a staple recipe in my house. Love that it’s not a million ingredients and that it looks super tasty! Everything is better with pesto, but also with bacon! This looks so amazing, I’d love to dive right in! I love using spaghetti squash as a grain-free pasta replacer. And anything with bacon on top has to be delicious. Haha! I love spaghetti squash! I must try it with bacon. I’m so glad you were able to recreate the recipe! WITH crispy chicken and bacon?!!! Oh my goodness that sounds good, especially with the pesto. Such a fun summer dish! 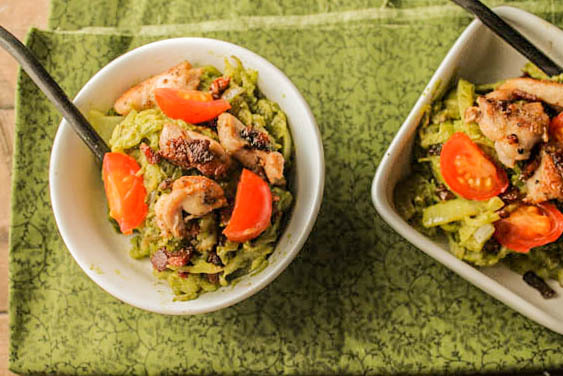 This yummy pesto chicken will definitely be a staple for out family dinners. Ummmm, you had me at pesto. And chicken. And bacon. Love the dairy free recipe options! This looks like a very wonderful flavourful recipe that my family will love! I used to eat spaghetti squash all the time! Great reminder to get it back into the rotation! This looks so comforting and fantastic! I could eat pesto for every meal. 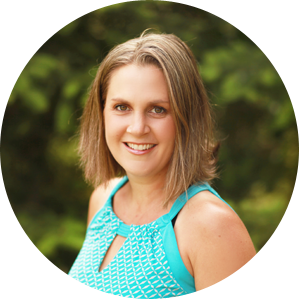 This is such a great meal change up and easier than I thought! Thanks for the idea! You had me at crispy bacon! Thanks for not keeping the recipe for yourself and sharing it with us. I have already tried it and everybody at home loved it. My pleasure Marisa, glad you enjoyed it! Wow, looks delicious and tasty. Can I use instead of garlic granules the pressed one? Really delicious recipe! My husband and I liked the spaghetti squash (trick is to not overlook it) and I just boiled regular noodles for the kids. Everyone was happy! Tessa’s pepperoni pizza casserole was a huge hit as well and the kids didn’t notice the squash noodles on that one! glad you liked it Kirsten! Yay Cassidy…thank for letting me know!! I really love spaghetti squash, but I can’t ever convince the rest of my family to eat it. I love the bacon and the pesto, it just makes my mouth water thinking about it! Wow – this dish looks like it is bursting with flavour! I am sucker for super flavorful meal Jeanine, and this definitely has lots of amazing flavors! I just love spaghetti squash! The more recipes the better!